The lab exercises contained in the network simulation experiments manual are based on the OPNET simulator (v. 9), a network simulation tool that was originally developed at M.I.T. It provides networking professionals with the option of implementing experiments from their homes or workplaces and the lab manual comes with directions for downloading the free easy-to-install software (special version to this book only--see system requirements below). These labs run through simulations closely tied to the material in the text so that you can visualize the discussions covering core network topologies. Various scenarios are presented within each topology, and review questions and a lab report exercise accompany each lab experiment. 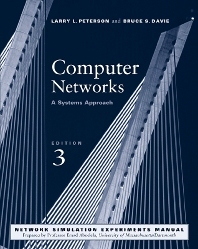 The experiments also follows the organization of Computer Networks, Third Edition, by Larry Peterson and Bruce Davie. Written by an instructor who has used OPNET simulation tools in his classroom for numerous demonstrations and real-world scenarios. Software download based on an award-winning product made by OPNET Technologies, Inc., whose software is used by thousands of commercial and government organizations worldwide, and by over 500 universities. Useful experimentation for professionals in the workplace who are interested in learning & demonstrating the capability of evaluating different commercial networking products, i.e., Cisco routers. Covers the core networking topologies and includes assignments on the ethernet, token rings, ATM, Switched LANs, Network Design, RIP, TCP, Queuing Disciplines, QoS, etc. *Instructors can download the solutions manual to the exercises in the Network Simulation Experiments Manual by clicking on the "Instructors" resource link in the upper right corner of the screen and searching for author "Aboelela." Dr. Emad Aboelela received his Ph.D in Computer Engineering from the University of Miami (Florida); M.Sc. and B.Sc in Computer Science and Automatic Control from the College of Engineering at Alexandria University (Egypt). Currently he is an Associate Professor at Taibah University, Saudi Arabia. He was a faculty member at University of Massachusetts Dartmouth for six years and at Southern Connecticut State University for two years. Dr. Aboelela is a senior member of both IEEE and ACM. He received the Distinguished Professor of the Year Award in 2009 and the Award of Academic Merit in 1998.